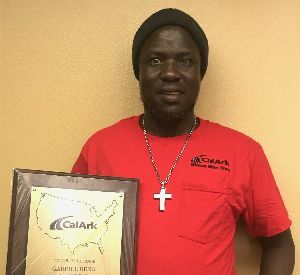 Gabriel Deng has spent seven of his ten years driving with CalArk. A resident of Chelsea, Massachusetts, he's originally from South Sudan and what his manager, Michelle Finn, calls a "go getter." She says he's "probably one of the hardest runners I’ve ever worked with. He is the man to call when you need the impossible to happen." Even though he runs hard, Gabriel makes time for exercising. When he stops for the day, he makes sure he gets some physical activity in before settling down for a break. He also stays fit by eating healthy and making a weekly Wal-Mart run to stock up on fruits and vegetables. Asked what advice he has for his fellow drivers on staying fit, he says to make healthier choices with food and find a way to exercise, even if it means just running around a parking lot. ​CalArk values drivers like Gabriel who work hard to make their miles and keep the wheels of American business turning. Thanks for making our business work!